In the wake of his resignation, which didn’t surprise me as much as it might have surprised others, the one area in which many commentators are in agreement is that Alex Salmond is one of the greatest politicians of his generation. You don’t have to have agreed with him to think that, you just have to understand what politicians should be going into politics to do, and that is to make a difference. In an age in which we just don’t know what many politicians stand for, we knew exactly what Salmond stood for, which was that he wanted a Scotland to have its political independence. This is a man with the skills to have risen to great power as a member of the Labour Party, but he stayed with the Scottish Nationalist Party from 1973 until the present day. The reason? Because he didn’t believe the Labour Party were sufficiently committed to Scottish devolution. He worked as an Oil Economist at the Royal a Bank of Scotland for over a decade before entering politics full time. He was first leader of the SNPfrom 1990 until 2000, during which time he decided to support the campaign for Scottish devolution, for which there was a referendum in 1997, despite many of his members’ reservations that it would just delay any chance of Scottish independence. This showed a political pragmatism, the concept of achieving your aims by gradualist tactics rather than by trying for a complete revolution, that was to serve him well in the Scottish Parliament. Having resumed as leader in 2004, he achieved with the SNP an unexpected victory in the Scottish Parliament elections. Unable to form a coalition, he managed to keep that a Parliament together by co opting the Greens into a ‘confidence and supply’ agreement where he basically governed on a policy by policy basis. Only a highly skilled politician could have made that last for an entire term, but what happened next was nothing short of astonishing. In 2011, the SNP won a full majority in the Scottish Parliament elections, despite an election system that had been created in 1997 specifically to stop that from happening. At that point, he had a mandate to go for a full referendum on independence (as that had been in his manifesto). As we know, he came out of negotiations with David Cameron on that manifesto with a magnificent result, framing the question so that the change was positive, getting 16 and 17 year olds into the franchise, and putting the date in the Autumn of 2014, on the 700th anniversary of Bannockburn and just after the nation-unifying Commonwealth Games. More importantly, it gave the SNP leadership the time to work out how best to campaign. And what a campaign it was. Described by Fraser Nelson of the Spectator, an unashamedly right-wing Scottish unionist commentator, as “probably the best political campaign I have ever seen”, Salmond, along with Nicola Sturgeon (rightly the favourite to succeed him as leader) and the rest of the SNP leadership came closer to delivering victory than anyone could have dreamed possible back in 2011 when David Cameron so carelessly sold out in the referendum negotiations. To go from a 60-40 deficit to at one point leading 51-49, to face down an entire establishment, in which only the Scottish Herald supported him out of all national newspapers, to manage to outwit a clearly rattled Alistair Darling in the TV debate without even properly answering his questions on the currency and other economic issues, was amazing. It means that even though they lost, the panic caused meant that Scotland was promised “nothing short of home rule” by Gordon Brown and basically “Devo max” by the Uk political party leaders, which really is the best of both worlds as they get independence on many things but with the backing of the a Bank of England and its currency. Yes Scotland’s campaign was relentlessly positive, harnessing the power of the grassroots and using poetry and optimistic language to the full. Yes, I found his refusal to engage in adult debate grating. Yes, I would have liked him to have properly condemned the intimidation of the press and No voters his supporters were perpetrating. Yes, as an economist I could have done without his constant use of unmeasurable variables (‘fairer’, ‘more just’, ‘prosperous’) that he could never have been measured on in the future. But no matter, it worked, and whilst it didn’t fully succeed, and he must have been particularly devastated to see such a relatively low turnout in the areas of Scotland he was most counting on (Glasgow, what WERE you thinking), he should be proud of how this referendum brought out democracy at its very best. Should he have resigned? Well, yes. It is a fine example to all of someone who is now at an age at which he knows he will never achieve the aim for which he joined his political party. He knows that there may never be a better moment for Scotland than this. It will be interesting to know what he will do next. I would hope he will join the “Team Scotland” he said he would form had Scotland became independent. He needs to hold the No campaign to account, particularly as it already looks as if some of their promises are fracturing (more of that tomorrow). He could perhaps become an EU commissioner, or an ambassador somewhere. Surely we can use his outstanding political skills for something? 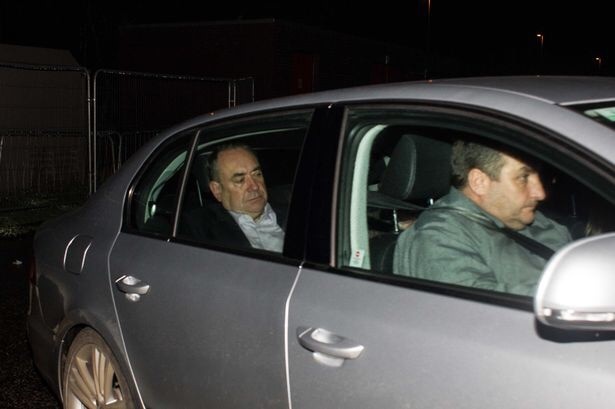 Or maybe Alex Salmond has had enough. Maybe he will just retire. Maybe he is just exhausted. Whatever he does, I can only say, as they would in France “Chapeau Sir, Chapeau”.